To drive the operations, GE has appointed Peter Lau as the chief executive officer for Europe and the Middle East of Current. Poised to transform how commercial, industrial and municipal users – hospitals, universities, retail stores and cities – manage their energy, Current will bring together GE’s LED, solar, energy storage and electric vehicle businesses into a holistic offering that is currently absent in the industry today. The business portfolio includes sensor-enabled hardware, software, fulfillment, product management and financing solutions. Lau will steer Current toward new efficient energy models that address customers’ goals today and in the future. “Current brings the union of energy-efficient hardware and software to market in a way that will change the face of energy provision forever,” he said. Current will reduce energy costs with a comprehensive set Ecomagination certified LED lighting systems and solar, energy storage and gas fired technology options. GE will optimise a solution that reduces energy use, produces power on-site and shifts usage. It will enable intelligent environments where lighting is networked with sensors that capture usage and energy consumption data to dynamically improve productivity. Current will also drive grid reliability and resiliency for utilities with solutions to meet the future challenges created by an increasingly distributed electric grid. 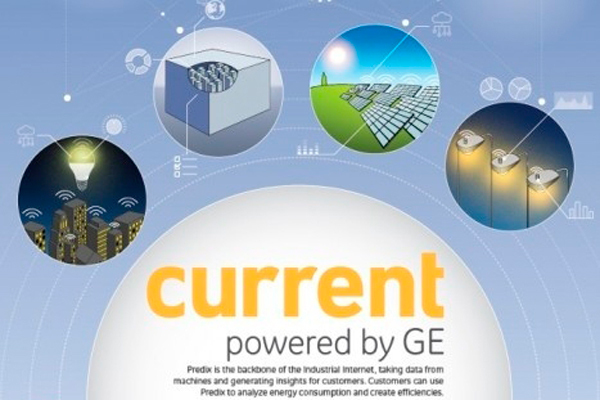 Through Predix, GE’s cloud-based platform for the Industrial Internet, Current will analyse energy consumption and provide customers with data around patterns and needs, along with recommendations to increase efficiency – from reducing consumption during peak hours, to generating power on site to creating new revenue streams for customers through the use of sensors and networked systems. These advanced solutions will help customers save an estimated 10 to 20 per cent on their energy bills, and help utility partners better manage their distributed load.